E-mail marketing is effective for engaging your target customers with a personal touch. But to make your message appear friendly, your e-mails should have your sign. However, you cannot sign your emails the way you sign on a paper. So, you need to create your digital signatures using email signature generators. An e-mail signature is not there merely to show your signed name at the end of the letter. More than being a sign of your authority, the marketers use it as part of branding strategy. As it helps in building some perception about a business, the use of digital signatures is catching up as a trend these days. So, what exactly you expect to achieve from email signatures? First and foremost, your email stands out from your competitors. They also send similar emails to your customers, who can then identify your email. But the signature should be unique in style, and it should be customized to represent your brand. With such a signed email, you can personalize your message. But it is not just about giving a personal touch to your message. It also should give boost to your branding efforts. When you want to build a good perception of your business when you sign your emails, it helps in demonstrating your company’s credibility as an established business. Also, you can have your name signed along with many other useful features such as your call to action for your recipients of the message and linking opportunities. You can also add links to your social media and contact information. The fact is that your email signature is more than a sign-off. Now that the significance of email signatures is well established and it is trendy, you would like to have them in a digital form. For emails, there is already plenty of software available free online. All you need to do is to copy and paste to make it as part of your email program. Then, each time you send an email message to your customers, your handwritten or digitally produced name will show up. You can also customize the signature to include photos, graphics, clickable links, etc. NEWOLDSTAMP is a perfect email signature generator that you can choose to customize the template as per your requirements. It lets you incorporate apps and social icons along with the name. If you want, it allows you to add a promotional banner at the bottom of your email along with your company’s CTA. If you need to add a link to some landing page of your website, you can do that also with this software. Additionally, the email signature creator enables you to centrally managing all the signatures of your team and updates them as well. So, choose this when you want to have control over all the digitally produced names of your company’s employees. Looking for an email signature generator? 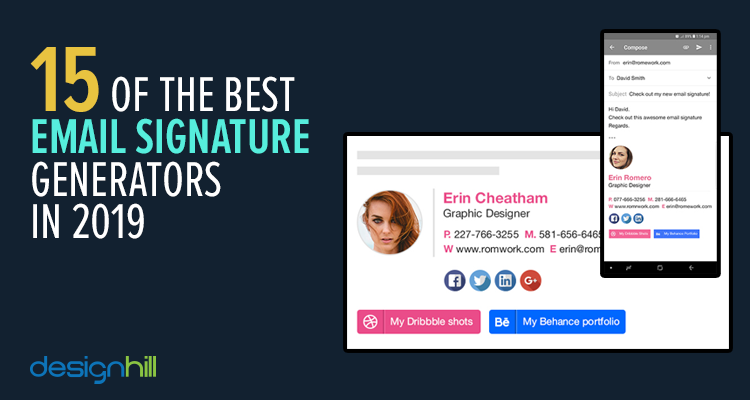 Email signature generator from Designhill is one the most popular and talked about signature tools. Many leading publications including Huffington Post, Forbes, Entrepreneur, and Inc. have appreciated this simple software. All you need to do is to feed it with your specific requirements. Then, just embed it into your email account. It generates visibly appealing styles of your name. Signature Maker is helpful especially when you wish to generate some perfect and professional handwritten digital names quickly. This is a simple tool that does not require you to install any software or plugins. The tool is based on HTML5, implying that modern browsers such as Google Chrome can easily handle it. The signatures you generate can be signed on PDFs and Word Documents as well as legal papers and contracts in your emails. You can use them also in your profiles, personal blogs, and forums. Also, they are deleted all of themselves in about 15 minutes. The software allows you to save the image of signature from your server just as you right-click on it. Such customized impressions of the names go well along with your other marketing materials such as your business card design to make a good impression on the recipients. WiseStamp is amongst high-quality email signature generators. You can either use a free version or get it as your monthly subscription service that comes with more functionality. The company claims that over 650,000 professionals use this tool. It lets you share your work with your clients with one click. You can add more social media icons to the signature. The tool is equipped with more than 50 templates. You are even able to personalize your message with Instagram photos to build your brand identity. HubSpot also has come out with its email signature template as an excellent option for business owners. You need to insert some personal information in the boxes. Then, add your social media links in the form. You can also customize colors, fonts, themes and other styles that suit your business. With such a personalized signature, your email design will convey your brand message effectively. The template also allows you to add your CTA image and text. If you completed some HubSpot Academy certifications, also add to the signature area. After you have filled these details in the form, you are ready to use the signature in your emails. Crossware Mail Signature is known for adding your personalized signatures and complaints to your all the emails automatically. This means that if you hired some graphic design services to design your handwritten digital name, you could add it to your emails. With the help of this tool, your logos, advertising banners, disclaimers, and graphics find mention without any efforts from your end. So, there is no need for you to configure the name on every workstation. While all the commonly available features of email signature generators are available with CompanySiG template, it is known for its additional unique feature. It gives you an option to insert your company map or any other map with your name. To start using this tool, all you are required to do is to copy and paste it email client’s signature box. The tool is useful also for managing your multiple digital names of company employees. You can have three signatures free. For more, you have to subscribe to the Pro version. MySignature is a user-friendly template that guides you in building your customized signature. One of the features of this tool is that you can use while you are on the move. This means that you can create it from your mobile device. The tool has many inbuilt analytics for tracking the performance of the images, banners, links, etc you added to the bottom section of your email. Mail Signatures is one of the easiest email signatures generators you can use in step by step manner. There are many clickable options available with this template. You need to provide some personal details such as your company name, your company logo in the form. So, if your logo designer created a unique logo for your business, the template gives you an opportunity to display it at the end of your email. The template lets you add your social media links, and you can stylize your fonts as well. After you have added the information, just click on the ‘Apply your signature’ button add the signature to your email messages. ZippySig is another useful platform to create customized signature solutions for your entire team. The template is known for delivering personalized options to the business owners as per their needs. It has more than 40 fonts, many layout options, and field labels to choose from as per your brand specifications. You can also include custom banners to your email at the last part below your signed name. In addition to that, the template gives you a dashboard. Email Signature Rescue has many templates that you can choose to create your customized name digitally. Just as you finish filling a form, you have the name ready for use with this template. You can securely store and host the signature you created with this platform. It will also be integrated with Google Analytics so that you can track the performance of your social media icons, links, images, etc. features. Note here that If you want to create a handwritten and stylish signature, we advise you to hire a freelance graphic designer who will design it considering your brand personality. Growth Mail is popular for its one unique feature. It lets you turn your signatures into your business advertisements. An employee sends thousands of emails annually. This means that your ads will reach to a massive number of potential customers. So, the template works as your branding tool to drive traffic. HoneyBook is one of the easiest email signature generators that need just 30 seconds to complete the process. The tool lets you choose from 8 templates which means you have many options for creating the name as per your graphic design ideas and branding needs. There are many other such tools available with this platform for this purpose. If you are looking for some of the tools that engage your customers and clients, then Rocketseed is a great option. This template allows you to convert your email message into a marketing tool as you create professional signatures. You can insert banners and legal disclaimers with your name at the end of your email message. Xink is another great template to create your corporate email signatures. It is a browser-based tool that you can use in Gmail (G Suite), Office 365, Outlook (browser), Outlook (Win/Mac), and Mail (Mac). This is a user-friendly interface that lets you create and manage your signatures for all of your company employees. So, these are the key email signature generators that most businesses owners are likely to use in 2019. Many of these templates come with free and paid versions allowing small businesses to choose as per their budget. Your digitally produced name for email is part of your marketing and branding strategy. This means that you should also pay heed to a lot of other designs such as your logo, business cards, brochures, etc. In that case, Designhill is the right marketplace when you need unique design ideas at one affordable price. Email signature generators are useful in creating customized solutions. These modern templates are equipped with useful features that let you add social media icons, images, links, and other engaging elements to your signatures.